Many young girls want to be princesses when they grow up. But how many believe they can be princesses who code? That's the message one startup is trying to send to parents and their daughters. 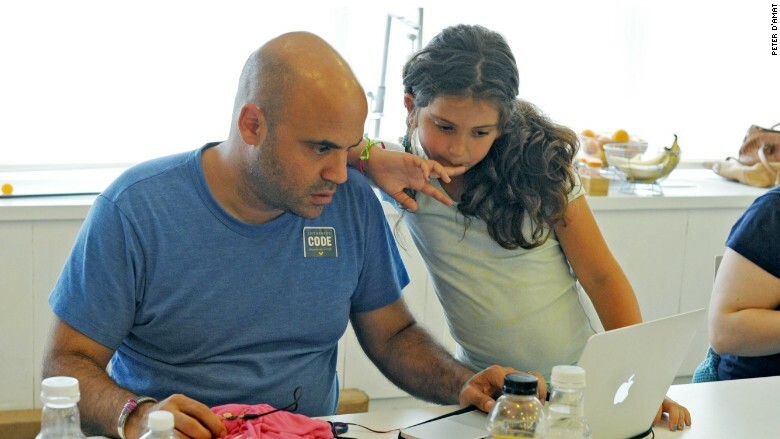 Jewelbots is developing smart friendship bracelets to get girls interested in coding. Girls can program the bracelets with their iPhones to light up in a particular color when friends are nearby -- or to send messages to each other. This weekend, Jewelbots hosted hackathons in New York and San Francisco to start spreading the word that girly girls can code. Malenky Welsh, a 16-year-old from Branford, Connecticut, spent eight hours at the New York event with her two younger sisters and her mom. Malenky's mother, Michelle, said she doesn't have a tech background herself but encourages her daughters to explore their creativity. Coding is one way to do that. For the parent-daughter pairs, the day's assignment was to turn an article of clothing into a wearable device. Each pair was given a tiny circuit board to power LED lights, instructions on how to code -- and then were told to get creative. Malenky crafted and sewed materials to form an eye-shaped insignia on her overalls. Then she wired it with LED lights. After a day of crafting and coding, girls presented their innovations to judges. The grand prize? An Oculus Rift. "In the future, it could have a sensor -- to sense if someone is coming too close," Welsh told judges. The wiring was the most difficult part of her creation, she said. Her favorite part? The glitter. Michelle Welsh (left) said seeing her girls create and code made "her heart happy." One girl, who was only 7, created a headlight belt for her camping excursions. A 12-year-old made a hat with LED lights. "When it started working, there was that 'Ahh' moment," she told the judges. "If kids find things they love and you give them the ability to customize it, there's no stopping them," said Sara Chipps, who co-founded Jewelbots with Brooke Moreland. Chipps has been a software developer since age 12; Moreland has a background in fashion. 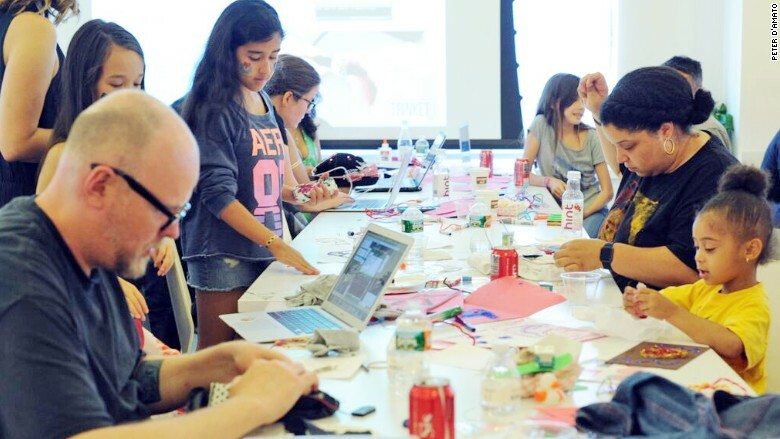 Sponsors of the "Bring Your Daughter to Hack" events included blogging platform Medium, Silicon Valley firm Andreessen Horowitz, Microsoft (MSFT), LittleBits, and Stack Exchange. They plan to host more hackathons in other cities like Washington, D.C. and Chicago. Jewelbots, which participated in Silicon Valley's Highway1 accelerator, will launch a Kickstarter campaign next week for its bracelets. Girls as young as two attended the event with their parents. Girls sewed an Arduino GEMMA circuit board onto clothing items to power LED lights. Father-daughter bonding time over learning to code. 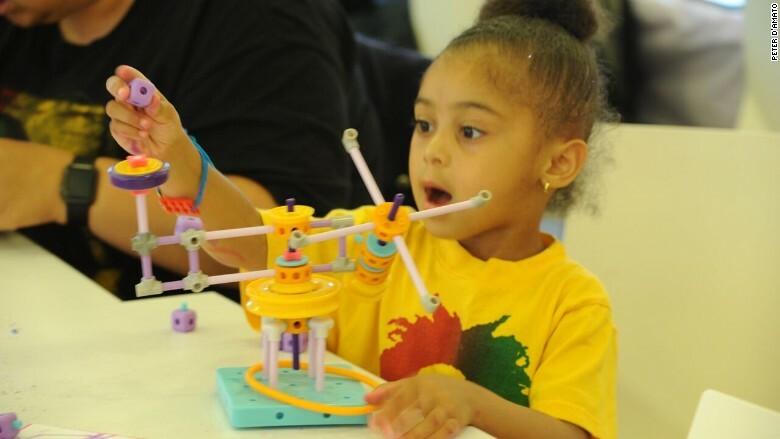 Girls could take a break from crafting and coding to play with engineering toys, like GoldieBlox. 13-year-old Sakura created a LED-dress collar. "Coding is a really cool thing to do," she said.